‘Tis the season to be glam and fabulous but you don’t have to sacrifice comfort for all of that. 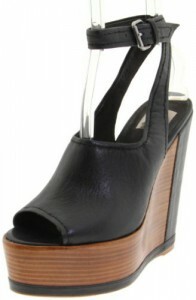 Dolce Vita comes up with the Camryn platform wedges that can go with anything. Short skirts or shorts or jeans and even dresses. This retro pair of shoes are chunky but the straps and the color make it look feminine. It has adjustable buckles for a snug fit and a leather lined foot bed for added comfort. Most people use red or green for Christmas but gold does it for me. Other than being catchy it actually looks more expensive. It comes in two colors, Black and dark Gold. The heels measure approximately 4 inches with a 2 -inch platform so it’s not hard to walk with. Buy this Dolce Vita shoe here!